The color most often connected to royalty, wisdom, and prestige. Fancy blue diamonds are quite valuable and often considered to be extreme rarities, even among other fancy colors. Blue colored diamonds are often sought after by some of the most rich and famous. Most fancy diamonds, including natural blue colored stones were originally found in India. However, South Africa has recently been one of the most dominating producers of fancy blue colored diamonds. They have taken the lead in the production of blue diamonds, specifically from the Pretoria mine. The Argyle mine in Australia is also famous for some of the magnificent blue and violet colors, often containing a grayish secondary hue. Blue colored diamonds are rarely found with a pure, straight blue color. They often contain overtones that are present due to the result of the Boron elements contained within. 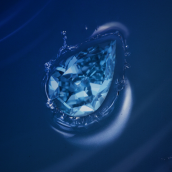 The most common secondary hues found with blue diamonds are either Gray-Blue or Green-Blue. The addition of Boron elements within the structure of the crystal lattice causes the color combinations of Gray-Blue, Grayish-Blue, and Violetish-Blue colored diamonds. Some of the blue diamonds found today are 'Type IIb' and represent only 0.1% of all natural fancy colored diamonds. 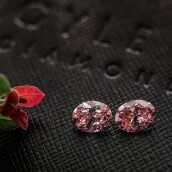 These are of the rarest stones and often sought after by both collectors and diamond investors. Green-Blue or Greenish-Blue (teal) colored diamonds usually contain small clusters of Nitrogen as well as Boron elements within the compound structure of the stone. Blue diamond's can appear as a Faint Blue, Very Light Blue, Light Blue, Fancy Light Blue, Fancy Blue, Fancy Deep Blue, and Fancy Vivid Blue. In the event of a secondary hue, a Fancy Dark intensity is also possible. 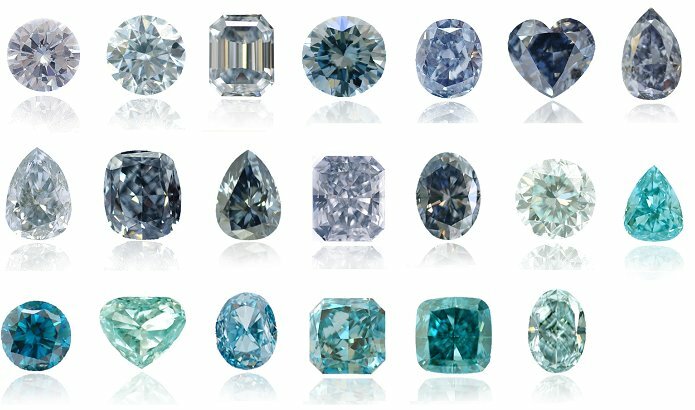 As a result of the color saturation, blue diamonds vary from the pale blue, to brilliant blue, to intense blue shades of color. As such an alluring and magnificent color, some fancy blue diamonds have managed to gain extreme popularity. Probably one of the most famous blue stones is the 'Hope Diamond.' The Hope Diamond was originally 112.25 carats when it was purchased in India and sold to the French King Louis XIV. It was polished to a 45.52-carat (9.10 g) Fancy Deep Grayish-Blue VS1 diamond. The Hope Diamond, sold for a record breaking $1,321,590 and is estimated today to be worth $200 - $250 million USD. In 2008, Laurence Graff, a famous jeweler, purchased the Wittelsbach Diamond at the Christie’s auction for $24.3 million. Laurence Graff re-cut the diamond, losing 4.45 cararts, to a 31.06-carats. He removed some "damage" to the girdle and managed to enhance the color of the stone. The diamond, now renamed the Wittelsbach-Graff, is now a Fancy Deep Blue, IF (Internally Flawless) stone. The absolutely alluring appearance of a fancy blue diamond is quite accepted by many. In fact, just considering the year 2011, a number of fancy blues were auctioned at significantly high prices. 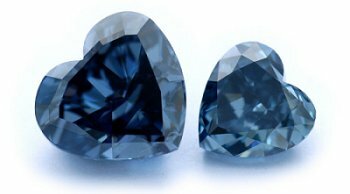 Natural fancy blue diamond's can be found in all cuts and shapes, including Princess, Emerald, Asscher, Oval, Marquise, Pear, Radiant, Heart, Cushion, and Round. 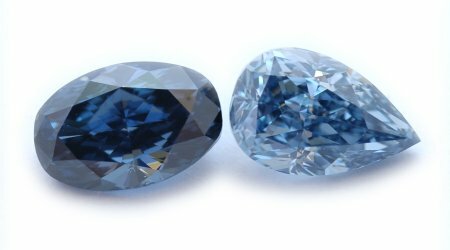 The demand for fancy blue diamonds often exceeds the supply and they are therefore considered excellent investment opportunities. They are both sound and reliable investments and quite desired by both diamond collectors and diamond enthusiasts. For inquiries regarding natural blue diamonds or investing in blue diamonds, contact us at: info@leibish.com.